Supporters of charter schools argue that since enrollment in such schools is purely a matter of parental choice and discretion, ineffective charter schools would quickly lose their students and be forced to close down. But this does not appear to be the case. Even though most research shows that charter schools are doing, at best, only slightly better than regular public schools, less than 2% of all charters ever opened have closed due to academic reasons. 1. Allen, Jeanne, Alison Consoletti, and Kara Kerwin. 2009. 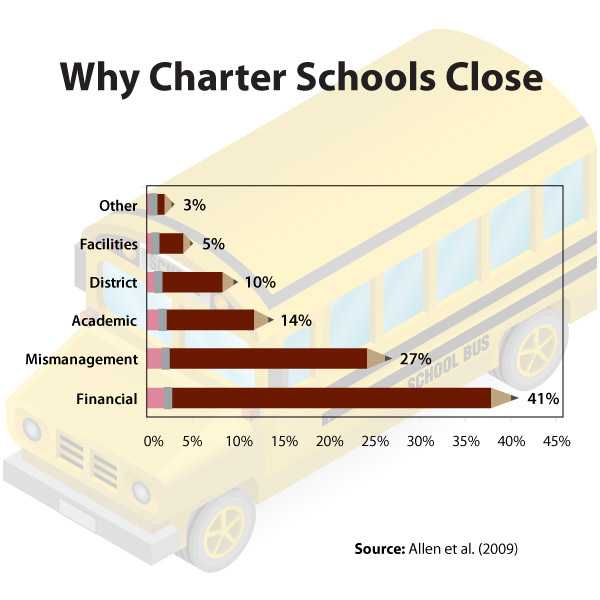 The Accountability Report: Charter Schools. Washington, D.C.: The Center for Education Reform. February. 2. Carnoy, Martin, Rebecca Jacobsen, Lawrence Mishel, and Richard Rothstein. 2005. The Charter School Dust-Up: Examining the Evidence on Enrollment and Achievement. Washington, D.C.: Economic Policy Institute and Teachers College Press.